The Grundig YB-300 PE Professional Edition is yet another model in the proud Yacht Boy series. This model brings impressive features and performance to the under $100 price category. 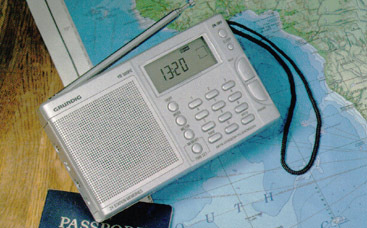 Coverage includes: AM (520-1710 kHz) and FM plus shortwave from 2.3-7.8 and 9.1-26.1 MHz. AM band tuning is in 9 or 10 kHz steps (selectable via a slide switch inside battery compartment). 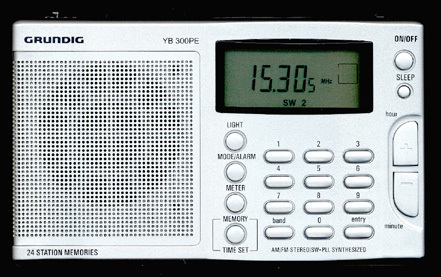 Shortwave tuning is in 5 kHz steps. FM is stereo is provided to the earphone jack (ear phones not provided). Twenty-four memories store your favorite stations. Direct keypad entry, Band button, scanning plus Up and Down tuning provides rapid access to any frequency. The YB-300 PE features a large LCD display with display lamp for momentary illumination. A built in 24 hour clock keeps you on U.T.C. World Time. 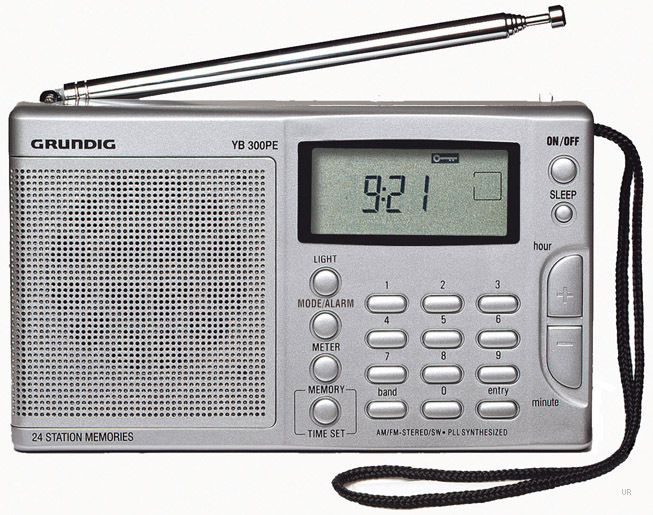 An adjustable 10 to 90 minute sleep timer turns the radio off even if your fall asleep. Other refinements include: DX-Local Switch, Scan and Lock. 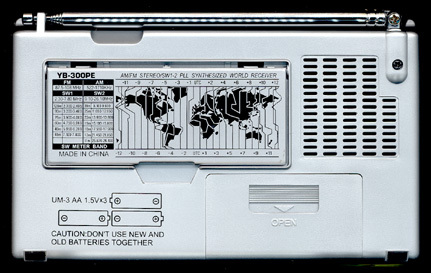 The back of the radio even has a flip-out tilt stand. The left side of the radio features the DC input jack, the external antenna input jack and earphone output jack. Your YB-300PE includes an AC adapter (4.5 VDC, 400 mA, center neg. ), vinyl carrying case, carrying strap, plug in external wire antenna and Owner's Manual. The YB-300PE operates from three AA cells. Titanium colored case 5.9 x 3.5 x 1.25 inches 13 oz. (150x90x30mm 368g). Copyright 1999-2017 Universal Radio Inc.